I’m glad you asked, because your question points out the paradoxical relationship of smoking and gum disease (also called periodontal disease). Studies have shown that tobacco use is one of the most significant risk factors for developing gum disease. In fact, the majority of smokers—over 64 percent—have this problem. Yet, surprisingly, tobacco users are less likely to show the tell-tale signs that prompt many people to become concerned about their oral health. This could be your situation—and it’s one of the reasons why the American Academy of Periodontology recommends that everyone (especially smokers) receive a comprehensive periodontal evaluation on an annual basis. According to the U.S. Centers for Disease Control, smokers have double the risk of gum disease compared with nonsmokers and are four times more likely to have advanced periodontal disease. The more cigarettes smoked and the longer a person smokes, the greater the risk. That’s why we ask smokers how much they smoke per day and how long they have smoked when we take their health history. But cigarettes are not the only contributing factor. All forms of tobacco, whether cigarettes, pipes, chewing tobacco or even e-cigarettes, increase your risk of gum disease. In addition, exposure to secondhand smoke is associated with an increased risk for developing periodontal disease. Common signs of gum disease include red, puffy gums that may bleed from brushing or flossing. In smokers, however, even diseased gum tissue tends to look firmer and bleed less when compared with nonsmokers who have gum disease. 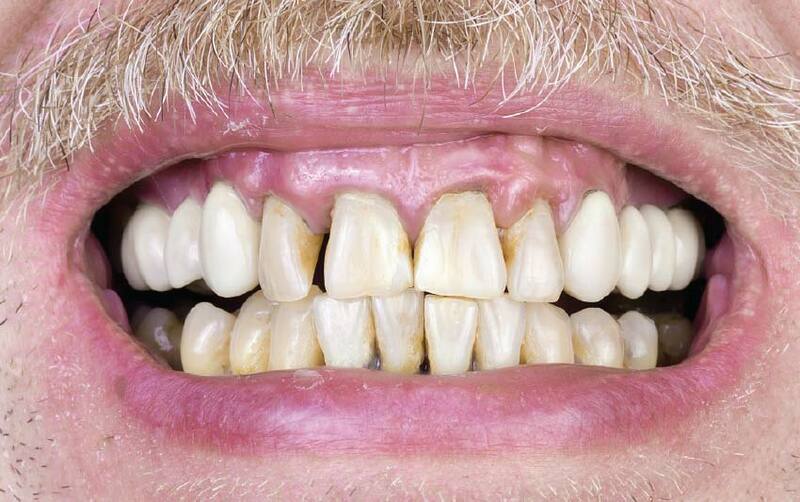 This deceptively healthy appearance of many smokers’ gums is known as “disease masking.” But it doesn’t mean there’s nothing wrong. While this patient has gum disease with bone loss and teeth shifted out of position, the gums look pink and are not swollen because the patient is a heavy smoker. Good circulation is essential to healthy gums because blood carries oxygen and nutrients throughout your body. However, nicotine causes a narrowing of the blood vessels and inhibits the growth of new blood vessels. The reduced amount of oxygen and nutrients getting to the tissues surrounding the teeth renders them more vulnerable to infection and slows healing when they are damaged. Yet this same restricted blood supply that harms the periodontal tissues can make smokers’ gums look healthy and pink, and not appear puffy in spite of being diseased. Research shows that smokers are more likely than nonsmokers to harbor the harmful bacteria that cause periodontal disease. Studies have also shown that smoking reduces the production of antibodies that are essential for fighting these bacteria. A decreased ability to fight infection and repair tissue means that gum disease progresses more rapidly in smokers. Chemicals in tobacco smoke cause cell damage and break down the connective tissues that anchor the teeth in place; and the heavier the smoking, the worse the effects. As periodontal disease progresses, it does further damage to the gums and other structures that support the teeth. The continuing deterioration caused by tobacco use can eventually lead to tooth loss. A large study that looked at data collected over a 16-year period found that heavy smokers were three times more likely to experience tooth loss than people who had never smoked. Treatment for gum disease is often less successful in smokers. That’s why it is important to let your dentist know how much you smoke and how long you have smoked. Your dentist may refer you to a periodontist—a dentist who specializes in the treatment of gum disease. The information you provide on your smoking habits helps us plan the most effective treatment options. For example, gum grafting and bone grafting are two relatively common periodontal procedures, but the success of both procedures depends in large part on blood flow. And while dental implants—widely considered the best option for replacing missing teeth—have a documented success rate of over 95 percent in healthy patients, the risk of failure doubles among smokers. Not only is periodontal treatment less effective in smokers, but smoking also interferes with the healing process. Among tobacco users, there is a high incidence of refractory periodontitis—that is, gum disease that keeps coming back after treatment. This can mean a constant battle against worsening gum disease that may require frequent re-treatment. However, the treatment of periodontal disease in smokers is not a lost cause. The effectiveness of periodontal disease treatment in smokers can be improved with various medications that a periodontist might use to enhance a patient’s response to therapy. Periodontal problems are just one of the ways that smoking harms your health. But here’s the good news: When you quit using tobacco, your body begins to repair itself. As more time goes by, your risk of developing gum disease gets lower. 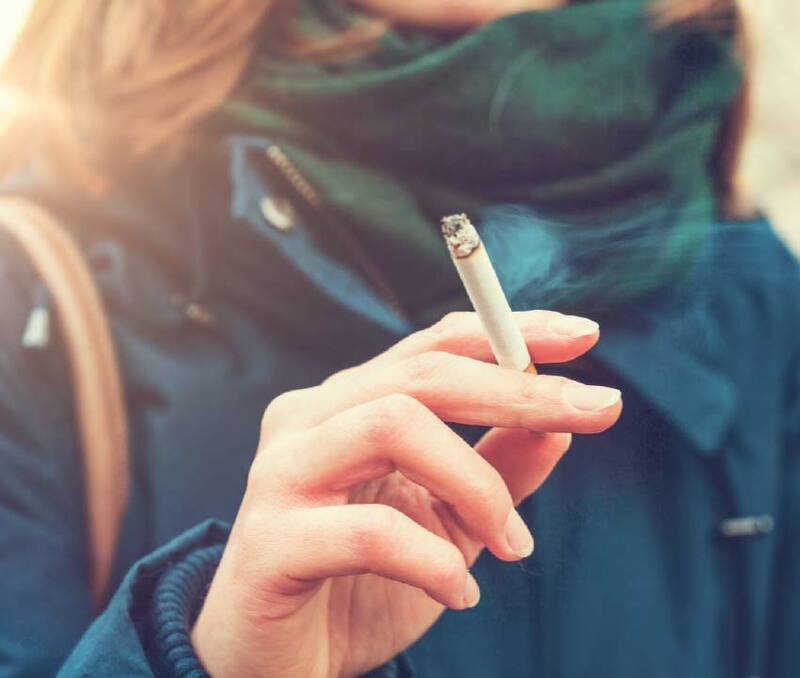 According to data collected in a major national study, ex-smokers who had abstained from tobacco for 11 years faced nearly the same odds of having periodontitis as people who had never smoked. Quitting smoking may be hard, but it is achievable—and there’s a lot of help available. Becoming aware of thoughts or behaviors that trigger the desire to smoke is a first step toward breaking the habit. Whether you choose cold-turkey or gradual withdrawal, you can benefit from joining a group that offers encouragement and support; individual counseling is also available. Withdrawal symptoms or cravings can be eased with over-the-counter nicotine gum or patches, or prescription medications. For more information about quitting, ask your health care professional, call 1-800-QUIT-NOW, or visit www.smokefree.gov.